A Bedfordview based company, The Media and Writer’s Firm, is one of the 11 companies that benefited from an R8-million investment by a health care company. 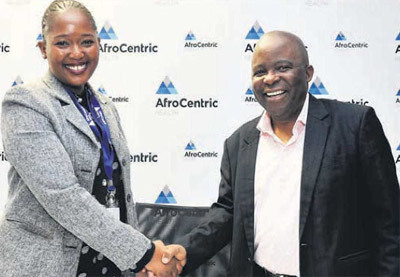 The AfroCentric Health Group recently announced that 11 black-owned businesses would benefit from its decision to use its BBBEE initiatives to forge stronger business relationships with smaller suppliers, and to assist them to grow their capacity, businesses and profits. The group announced two programmes, from which the small and medium enterprises benefited. The Enterprise Development Programme, in which the group has invested R3-million, has fourbeneficiaries; namely the Eluthand weni Maternity Clinic in Ekurhuleni, A' Dare Women's Wellness Centre in Mabopane, Xenia Information Technologies also in Ekurhuleni and Karogano Trading and Projects in Soshanguve, Pretoria. The Supplier Development Programme, which saw an investment of just over R5million, has seven beneficiaries. These include Black Ground Outdoor in Midrand, The Media Writer's Firm, T.L Nursing Agency in Centurion, Provision Research and Events in Midrand, On Point Mobile Spa in Lyndhurst, Kwelanathi CC in Midrand and Zwide Photos in Soweto. The group's chairperson, Dr Anna Mokgokong, said the group believes its enterprise and supplier development programmes will make a meaningful contribution to inspire key growth and success among the entrepreneurs that form part of the initiatives. Dr Mokgokong is regarded as a leading business figure in driving transformation in corporate South Africa.